The past month has been busy at work and with a bit of travel. However I am pleased to say that I have been squeezing in a bit of sewing here and there. Some of which has been Simplicity 1322. I purchased this pattern during a recent Simplicity sale and decided to make a wearable muslin from some fabric in my stash. Some faithful blog followers may recognise this cotton from my first ever blog post! 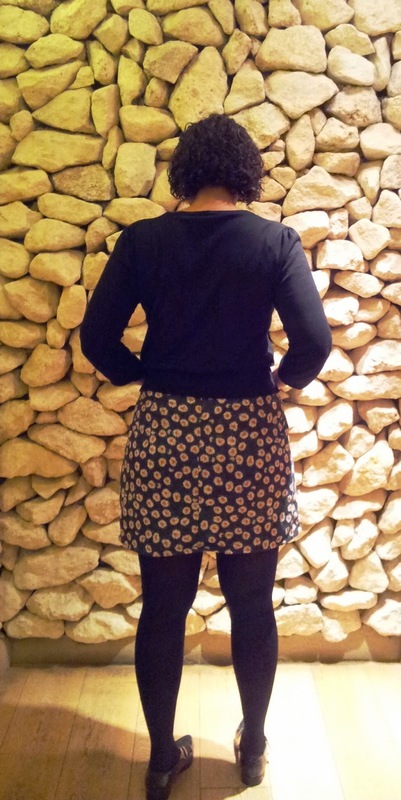 This skirt is a perfect little stash buster as it only uses 80cm of fabric. This cotton print was originally purchased form Fabricland for around £4 per metre and I underlined it with a blue polycotton from my stash, picked up for £1 per metre from good old Brixton Market. Other than the underlining, I didn't really make any changes. I changed the construction order as per the pattern instructions as I used an invisible zipper in the back rather than a lapped zipper. Therefore I sewed the front to the back pieces and then inserted the zipper just before attaching the waistband. I used french seams for a neater finish (as the skirt is unlined) and hemmed it using bias binding. The only other changes I plan to make are to use a longer zipper - I really struggle to put this skirt on over my hips. I cut a 16, which is perfect for the waist, but I think that next time I may grade out to an 18 on the hips as you can see a couple of pulling gathers across the front. Finally a word of caution about this skirt - when you sit down the split really does fall open. Easy to amend next time, but when testing the fit of this skirt I would most definitely baste and (gently) sit down to see how you like it. Despite all of the criticisms mentioned above (it was a muslin so criticising the fit is an important process) I do really really like this pattern. It's not often I come across skirt patterns that I fall for straight away. The cross over front is so on trend at the moment and this skirt would work so well in so many fabrics. I have it in mind for some leftover denim from this project. 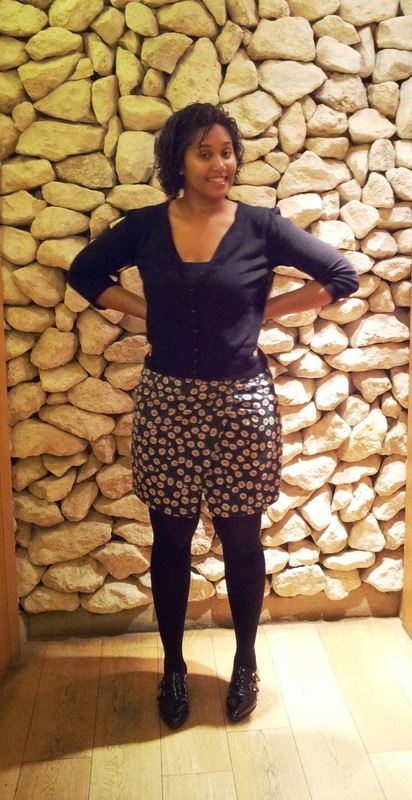 It's an excellent stash buster, wardrobe builder and lets face it, a pretty cute skirt pattern. I expect that many of my remnants will end being another iteration of this pattern. Haha, my expressions in these photos look so surprised. I guess that is what jetlag and a Sunday session in Angel including cocktails does to me. Seeing as I look quite amused maybe I should take my blog photos like this more often. It is sad that we have so few hours of daylight these days so getting outside snaps will be tricky for the next couple of months, not to mention cold. On a warmer note I have been sewing some clothes suited to sunnier weather for my upcoming work trip and holiday. I can't wait to be wearing summer dresses in the middle of December and you guys will have to wait for my blog post as it is too nippy (literally) to photograph them. Anyone else found any good skirt patterns recently? Really cute and versatile. Even when I was super thin, I hated waistbands because they always rolled over and creased when you sat too long, as in college classes. That started my love of faced waistlines and I have never gone back. Petersham is wonderful stuff, or if lining, you can just join at the waist seam and topstitch to secure. This is a very cute skirt and it fits you nicely. I am really taken with this pattern. I am always on the look-out for interesting skirt patterns and this one totally fits the bill! I think I may have to make this at some point too. Have you seen the Sutton Blouse as made by Kelli on Sewaholics blog? That looks very cute too. It seems quite a good stash buster if you use different fabrics.